Natural oils have been an integral part of my beauty routine for years. Hair, skin, cuticles, all benefit in all of the best ways from the use of oils. Natural oils can soften, condition and seal moisture into dry, distressed tresses, cleanse, moisturize and protect skin and as part of a good maintenance routine, make cuticles look picture perfect. A couple of years ago, I discovered the joys of Tarte; their beautiful makeup including their velvety eye shadows and incomparable Amazonian Clay 12 Hour Blush. My first Tarte purchase was a holiday set, in 2013. I was on a distraction Internet spending bender and happened upon one of the last ones available on the Ulta website and bought it on impulse. The Gorgeous Getaways set came with, among it's many delights, a little bottle of light, silky, very moisturizing oil called Maracuja Oil. I wasn't expecting anything special from it, really. Oil is oil, after all. Packaged in a beautiful, translucent deep purple (smoooooke on the waaaater dun-dun-dun... dun-du-du-du. You're welcome.) glass bottle with a gold tone push - button dropper cap, this delicate oil is protected from incursion from light and air. The packaging is pretty enough for display on a vanity or dressing table yet it will fancy up a cabinet or tucked away little spot. The normal packaging is a plain gold cap, this purple stamped bit of frippery was just for this year's Sweet Dreams Bon Voyage Collector's Set but if you ask me, it should be permanent. I mean, look at it. It's so pretty. 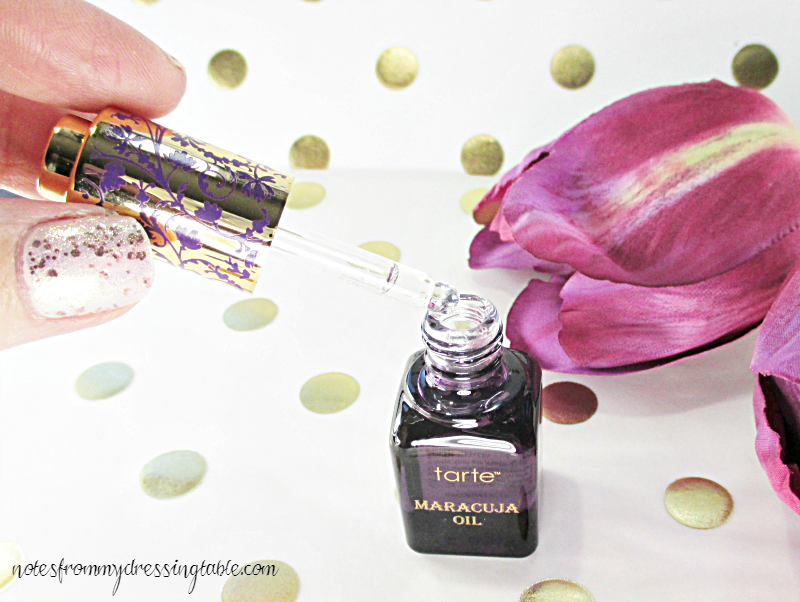 Tarte Maracuja Oil is nearly clear with a thin viscosity for an oil. It spreads readily and easily across the skin or through the hair and sinks in swiftly, leaving behind little on the surface yet a deeply hydrated feeling. On days when the air is very dry and my skin is screaming for relief, I will take up a dropper full of this oil and apply it to my face and massage it in. Instant relief. Calm, quiet skin. Not greasy, not slimy. Just soft. I get the same lovely result for my hair. I am a convert. Tarte Maracuja Oil is one of my favorites and when I have used up my little deluxe samples, I plan to purchase a full sized bottle. I could only wish that it would come with that divine stamped pattern. 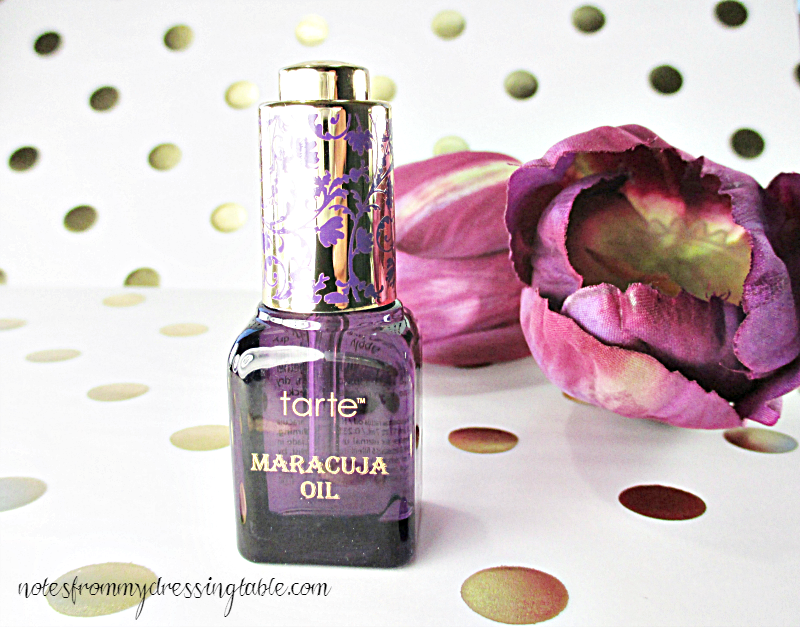 Have you tried Tarte Maracuja Oil? What do you think of it? Please tell me in a comment. I've tried a little sample of this oil and really like it too. I would pour my little samples into that beautiful bottle! So pretty, and the oil is good stuff, though I personally wait for a deal before I splurge on it. I JUST got this in and need to use it now! I can't say I was ever in the "cool club" while I was growing up. And not much has changed since CBD capsules I entered the realms of business.